Can architecture be ordinary? Or, perhaps a better question, what is architecture’s relationship to the ordinary? To answer this question, we must first ask another: what is “the ordinary”? In art, the vernacular, the popular, and craft are opposed to the fine, and in nineteenth-century realism, which sought to portray scenes from the everyday life of the common people, the ordinary is opposed to the noble and mythological subjects of history painting. In the twentieth century, deadpan display and pop exaggeration of the ordinary are opposed to abstract expressionism. In many ways the ordinary is a derivative, even negative category, opposed to positive qualities that it is not—not elite, not exceptional, not interesting, not unique, not extraordinary. The ordinary is common, boring, and banal, irregular and imperfect, whereas the extraordinary—that which is outside of or in excess of the ordinary—is noble, novel, individual, progressive, noteworthy, unexpected, excellent, ideal, even perfect, transcendent, rich, rare, and ornamental. Some of the older meanings of ordinary come from the Christian liturgical cycle—ordinary days as opposed to feast days. In this sense, the ordinary is opposed to the sacred, designating that which is not endued with the magic and mystery, the numinous qualities of the eternal, the mystical, and the dream. But the characteristics of the sacred can alter. Whereas in an earlier period the sacred embodies the regular, the regulated, and the perfect, in the twentieth century, according to Henri Lefebvre, the unremarked and unremarkable quotidian has been replaced by the regulated life of a planned society. He proposes, as an alternative to the planned, the festival, a new, exceptional space, a kind of earthly eternal, in which ordinary, regulated time is replaced by festival time. The festival introduces the idea of the aesthetic, and with modern secularity, the aesthetic replaces the sacred as the agent and locus of numinosity. Here the ordinary enters into a new opposition, becoming that which is not art. And art, in its turn, takes up the job of reforming the ordinary. All of this casts the ordinary as leftover, comedown, fallen. However, there is another sense of the word that defines the ordinary as something valuable in its own right. 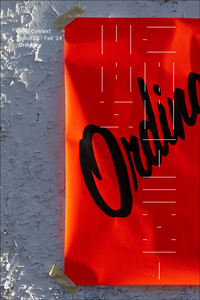 Ordinary is an old word, found in classical Latin as ordinarius, derived from ordo, order. Ordinarius means regular, orderly, by right, in the normal course of things. Judges and church officials are “ordinary” if regularly appointed, and have jurisdiction over normal situations. The word comes to mean those things that are unvarying, and also a rule for behavior, as in the Ordinary of the Mass. In this older sense, ordinary is a positive quality rather than a negative one, something that is as it should be, something that is orderly and ordained. Architecture is ordinary in this sense, in that it ordains an ordinance, a way of being and doing, by means of its form. Architecture’s romance with the ordinary is coextensive with modernity, according to Peter Collins. Collins claims that the period from 1750 to 1950 is distinguished by the fact that the villa or small house becomes, not only a legitimate subject of architectural investigation for the first time, but the paradigm for all of architecture. Villas are at first the province of the wealthy, but the principles of picturesque irregularity, when mixed with utopian socialism, progressive reform movements, the drive to improve the quality of manufactured goods in Germany and England, and the search for “the style representative of the times,” become a program for the design of the new ordinary in the twentieth century. And with the avant-garde, the ordinary becomes an agent of revolution. Following Loos, Le Corbusier declares: “Architecture or revolution. Revolution can be avoided.”  Substituting the planned for the quotidian, architecture is to remake the ordinary, creating new type-forms for the homme-type, the ordinary or typical human being (“If our spirits vary, our skeletons are alike” ). Engineering modern life by means of that locus of ordinary life, the dwelling, Le Corbusier aims to create a new ordinary, a new “natural order of things,” adequate to the times. Thus the ordinary as a new order or rule will reform the fallen, profane ordinary of existing everyday life. The two, in some ways opposite senses of the ordinary that we have defined coexist uneasily in artistic practice, exemplified in architectural modernism on the one hand, which attempts to create a new world by means of design, and deadpan and pop on the other hand, which aim to present the ordinary as extraordinary. In architecture, the questions posed by deadpan and pop are: Can the ordinary be portrayed as it is? Gayatri Spivak notes that the very act of labeling a part of experience “everyday” alters its fluid immersion in an ongoing stream of events, substituting for the “unconceptualized” nature of the quotidian a hypostasized mental object formed according to the rules of theoretical operations. Does the very portrayal alter its quotidian, fugitive, flowing quality? A further question is: Can architecture represent and not propose? Can an activity that intervenes in the ordinary refrain from ordaining? The questions raised by architectural modernism are: Can the common, everyday, banal, and unnoticed be designed at all without destroying its essential nature as unremarkable, unremarked, and unplanned? 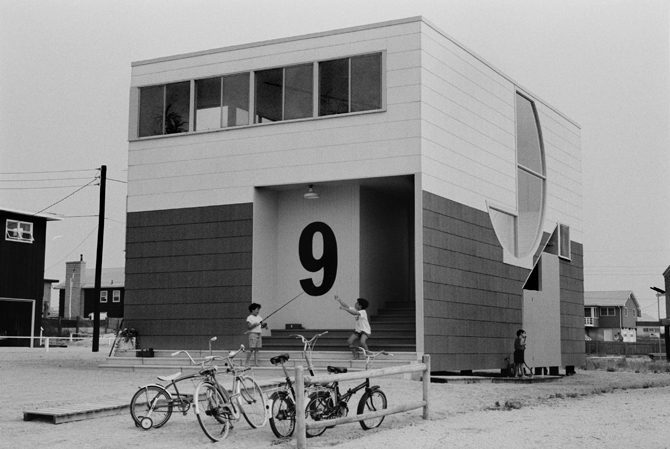 Can an architecture that designs the ordinary, in other words, itself be ordinary? Or does it not, by its reform of the ordinary, step outside of that realm into that of the artful, and therefore the extraordinary? However, by studying Las Vegas, Venturi and Scott Brown approach the ordinary by means of the extraordinary. And, perhaps influenced by its hypertrophied environment, Venturi and Scott Brown’s solution to the problem of designing the ordinary comprises two techniques: deadpan and exaggeration. The deadpan in art addresses the first definition of the ordinary as the quotidian. It is epitomized in Marcel Duchamp’s Fountain of 1917, a urinal sanctified to artistic status by its installation in Alfred Stieglitz’s New York art gallery 291. Venturi and Scott Brown’s more immediate source for deadpan technique is Edward Ruscha’s photographs of Los Angeles and Las Vegas in art books such as Every Building on the Sunset Strip and Thirtyfour Parking Lots. In Learning from Las Vegas, Venturi and Scott Brown produce a two-page spread that imitates Ruscha’s Sunset Strip pictures. A series of photos taken by a camera mounted on a pickup truck display without comment the entire length of both sides of the Las Vegas strip. But what worked for Duchamp and Ruscha does not work as well for architecture. Lacking a special locus removed from everyday life to mark it off from the ordinary, architecture cannot rely on its location to designate it as such. Thus the difficulty for Venturi and Scott Brown is to translate theory into practice. 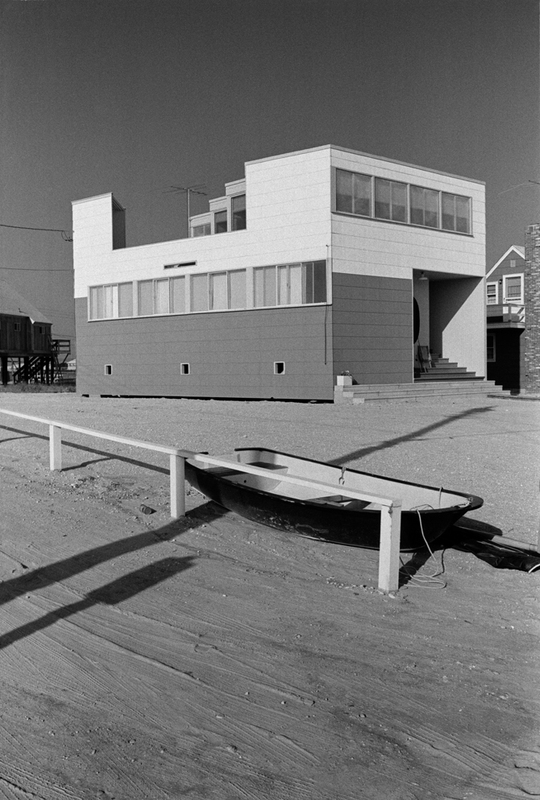 Venturi and Scott Brown’s 1967 Brighton Beach Housing Competition entry is an example of this deadpan approach to the ordinary. Its contextual massing and conventional construction, plans, and façades fly in the face of the revolutionary aims imaged in the modern megastructures then in fashion. The essential problem with this project, as far as the competition jury is concerned, is that it is so contextual that there is no way to tell that it is architecture. Philip Johnson sums up this criticism by calling the project “ugly and ordinary,” an appellation Venturi and Scott Brown adopt as their byline. 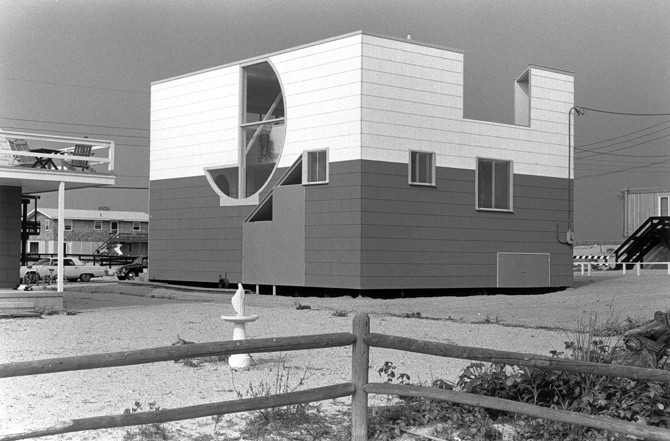 Lieb House (Barnegat Light, New Jersey, 1969) epitomizes the opposite technique. Following in a long American tradition from Frank Furness to Henry Hobson Richardson, Venturi and Scott Brown eschew the role of the architect who orders and ordains, instead employing the extraordinary to represent the ordinary. 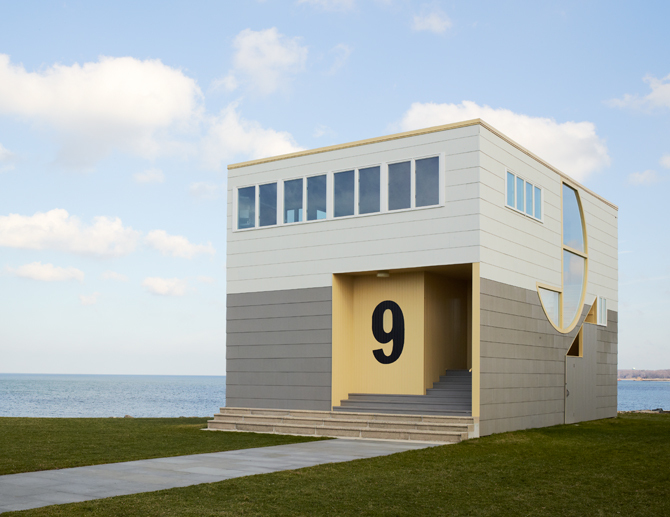 This “bold little banal box,” as Venturi called it, is set in an ordinary environment, the New Jersey shorefront. 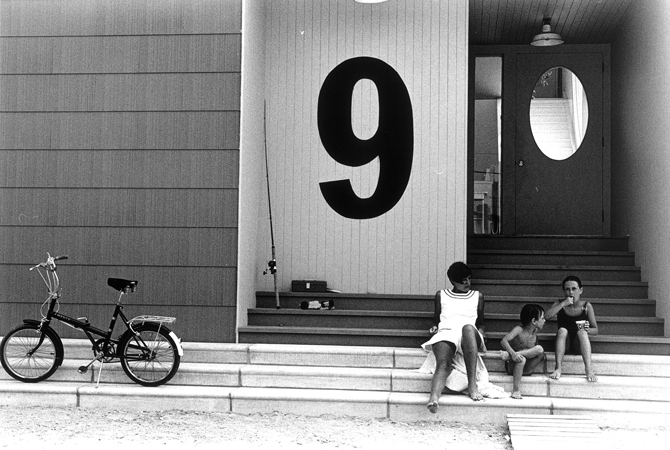 Its main ornament is a huge number 9, easy to locate in the flat, featureless, alienated world of telephone wires, sandy paths, and houses that looked alike even though they are all different. The bored mother and children sitting on the front steps epitomize the banality of everyday life. Yet the house is anything but banal. Flat roofed rather than pitched as are its neighbors, the building forms an outsized object, odd and undecipherable, giving the faintly comic impression of an overinflated balloon or something seen in a fish eye lens. In both plan and massing, the house makes reference to Le Corbusier’s Villa Savoye (Poissy, Yvelines, France, 1931). Like that of Le Corbusier’s villa, Lieb House’s layout is an inversion of the ordinary American house plan: the living room and kitchen are on the second floor, the premier étage, where the views are, with four small bedrooms on the first floor. The first thing encountered upon entering is a service area with washer and dryer to receive bathing suits and beach towels. This layout combines an attention to the expediencies of beach life with an inversion of the expected. Collapsing the main floor terrace in the Villa Savoye with its roof deck, in the Lieb House a partially screened terrace is carved out of the almost square rectangle of the house. 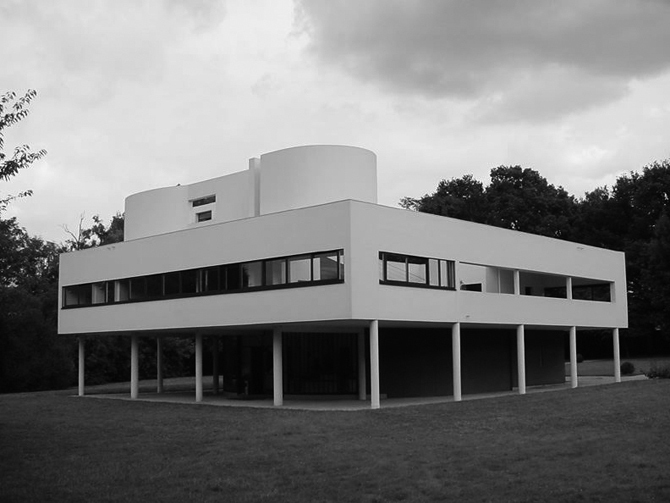 The Villa Savoye exploits the capacity of its then-novel reinforced concrete frame structure to allow for long horizontal openings and flowing facades, articulating the surface as light, non-loadbearing construction covering a supporting frame. In a similar vein, Lieb House makes reference to balloon frame construction, a vernacular and mass-market form of building developed in the United States. Composed of a uniform network of small members, joists and studs, with minimal reinforcement at floor levels and around openings, the surface sheathing plays as necessary a part in the structure as do those members. Thus holes can be punched virtually anywhere without weakening the frame. This characteristic of the structure allows Venturi and Scott Brown a free hand with the building’s façade. The formal mechanisms of the volume and the façade are not those of the deadpan, but rather the extraordinary mechanisms of pop art. Like pop, the house employs exaggeration, inversion, and distortion; paradox, humor, and ambiguity; scale shifts and unorthodox organization to call attention to the ordinary at the same time as it flouts its conventions. These devices, articulated mainly in window size and placement, make complex allusions, not only to international modernism, but also to American Shingle Style architecture, itself a play on traditional American wood frame construction. The change in cladding color halfway up the façade becomes a kind of “regulating line” that organizes these deliberately disparate elements. The overall effect of the design might be called “ugly and extraordinary.” The ugly is the other, opposite pole of the extraordinary, avoiding the previous glorification of the ordinary by means of the beautiful. As a look at the Villa Savoye shows, this is also a modernist technique. The large, flat, ungainly rectangle balanced on five spindly legs is a form whose shock value time and inurement has only somewhat blunted. Le Corbusier’s taut, abstract volume, indebted to Purist aesthetics, makes the point that what looks massive is actually light. The forms are detailed in such a way as to reduce the building’s materiality to nearly nothing, and it seems to hover like space ship just touching down. But the Lieb House plays with heavy and light, material and immaterial, in such a way that both must be kept in mind at once. The pop elements and the realist construction materials tussle with each other, never letting the building entirely escape its nature as an actual, material object in real space and time. Le Corbusier’s construction is a novel form; Venturi and Scott Brown’s is a system with both traditional and contemporary resonance. Thus the Lieb House exists in a more complex relationship with the ordinary than does the Villa Savoye. Quotidian the Lieb House may not be; if it is a festival, however, it is a festival with one foot on the ground. The Lieb House is an iconic example of Venturi and Scott Brown’s approach to the ordinary, which holds the paradoxes of both definitions in a relationship as taut and tense as the surface of the building itself. It also provides an example of the inscrutable status of the ordinary in a post-modern society. In 2010, Deborah Sarnoff and Robert Gotkin moved the small house to Glen Cove, New York, carefully renovating it to replicate the appearance of the original design. There it functions as a guest house on the site of their much larger dwelling, also designed by Venturi and Scott Brown in 1985. In its new site, location does finally designate architecture. 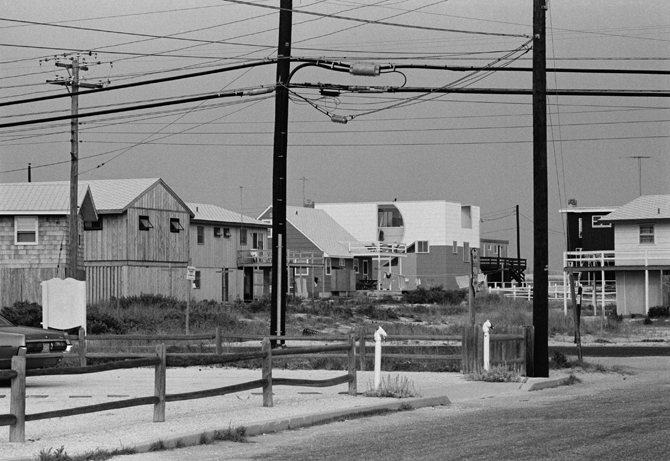 What was a paradoxical presentation of the ordinary in the beach community of New Jersey now joins the urinal and the Sunset Strip as a kind of instantiation of it, ratified by its setting. In its new location, however, the former beach cottage represents something of a conundrum. Without its ticky-tacky Jersey Shore environment to play off, it is as isolated from its former meanings as a urinal in an art gallery. Its new location and status begs several questions: Is it an example of the revival of the ordinary? Does the translation in space accomplish an archiving of modernism’s romance with the ordinary? Or, is this translation rather an attempt to redeem the ordinary? Through the “transfiguration of the commonplace,” in Arthur Danto’s phrase, modernism sought both to design and display the ordinary. Here, moving the small house is an act of faith that the representation of the ordinary can be preserved. Does moving Lieb House “retransfigure the commonplace,” to alter Danto’s phrase, making the ordinary into art and thus redeeming it? If so, it may be a quixotic effort, since the end of Robinson’s story is the effacement of the family from the homely ordinary life of their small town, as they disappear down the road. 1. Bernard Rudofsky, Architecture without Architects (New York: Doubleday, 1964). 2. Henri Lefebvre, Everyday Life in the Modern World (Piscataway, New Jersey: Transaction, 1984). 3. Oxford English Dictionary online, s.v. “ordinary” (Oxford: Oxford University Press, 2014). In Livy, the meaning is a magistrate or consul appointed according to normal and legitimate procedures. It refers to a kind of soldier and a kind of servant. 4. Peter Collins, Changing Ideals in Modern Architecture, 1750-1950 (Montreal: McGill Queens University Press, 1965), 42ff. 5. See Richard Wagner, “Art and Revolution,” The Art-Work of the Future, and Other Works, tr. W. Ashton Ellis (Lincoln: University of Nebraska Press, 1993 [1849/1895]). 6. Adolf Loos, “Architecture,” in The Architecture of Adolf Loos, ed. Yehuda Safran et. al. (London: Arts Council of Great Britain, 1985), 108. 7. Le Corbusier, Towards a New Architecture (New York: Dover, 1985 [1923/1927]), 269. 8. Le Corbusier, The Decorative Art of Today (London: Architectural Press, 1925), 76. 9. Gayatri Spivak, lecture, Princeton University, April 1991. 10. Robert Venturi, Complexity and Contradiction in Architecture (New York: Museum of Modern Art, 1966); Robert Venturi, Denise Scott Brown, and Steven Izenour, Learning from Las Vegas: The Forgotten Symbolism of Architectural Form (Cambridge: MIT, 1972; rev. ed. Cambridge, MA: MIT Press, 1977). 11. Venturi and Scott Brown, Learning from Las Vegas, 53. 12. 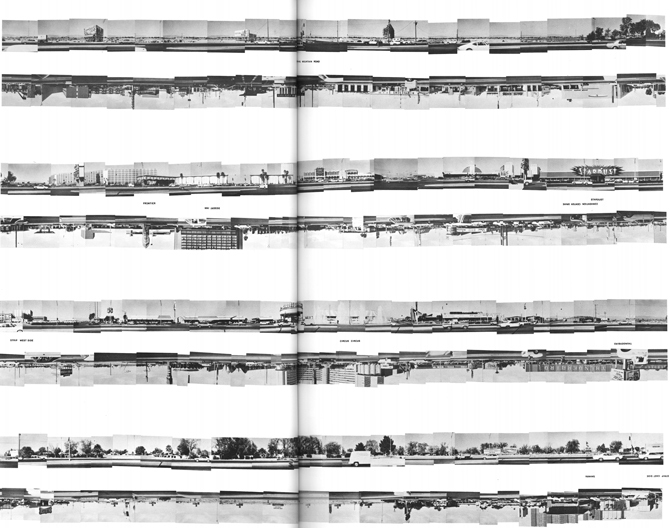 Edward Ruscha, Every Building on the Sunset Strip (1966); Thirtyfour Parking Lots (1967). 13. While masonry, the walls are not load bearing. 14. Vincent Scully, Jr., The Stick Style and the Shingle Style: Architectural Theory and Design from Downing to the Origins of Wright, rev. ed. (New Haven: Yale University Press, 1971). 15. Marilynne Robinson, Housekeeping (New York: Farrar, Straus, and Giroux, 2005 ), 166. 16. Robinson, Housekeeping, 15-16, 18, 25. 17. Arthur Coleman Danto, The Transfiguration of the Commonplace: A Philosophy of Art (Cambridge: Harvard University Press, 1981). Deborah Fausch is an architect and architectural historian/theorist/critic. She has taught at Parsons School of Design in New York, University of Illinois at Chicago, and Washington University in St. Louis. She is a co-editor of Architecture: In Fashion; her writing has also appeared in Perspecta, Daidalos, archithese, Any, and various edited compilations. She is working on a book concerning the architectural and urban theories of Robert Venturi and Denise Scott Brown.